Dezeen promotion: École des Ponts ParisTech is now accepting applications for its Design by Data masters programme, where architects, designers and engineers push the bounds of new technologies. The French university's advanced masters course is open to full- and part-time students who want to train in the fields of computational design, robotics and digital manufacturing in the construction industry. Since launching the programme in 2016, its director Francesco Cingolani, an architect and entrepreneur, has worked to reinforce the position of École des Ponts ParisTech as a hub of Paris's innovation scene, and to foster a healthy ecosystem of makers and industrial partners around it. 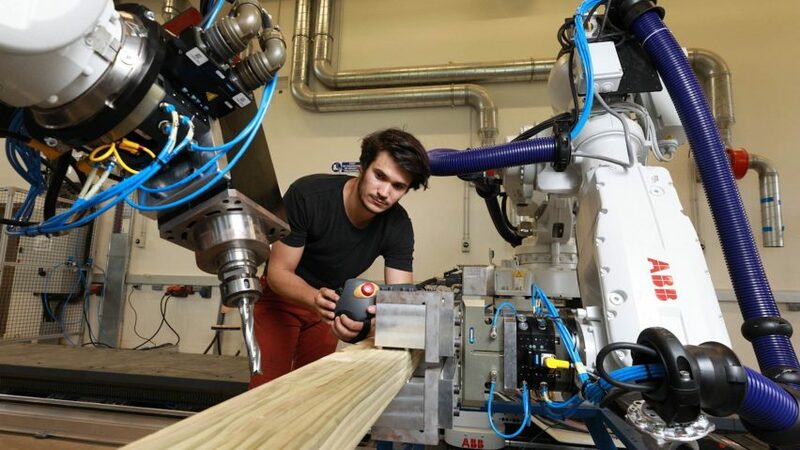 The École des Ponts ParisTech has also added a makerspace for digital fabrication, boosting its experimental research and design facilities further. "When we opened the programme almost three years ago, we wanted to create a learning experience of a new kind, mixing experimental design with research and blending professional activity and education," said Cingolani. "The feedback given by students joining the programme from different cultures and backgrounds was enthusiastic." "We decided to move on to better integrate research and education at school, as we strongly believe that one can feed the other," said Olivier Baverel professor at Ecole des Ponts and scientific head of the programme. "In fact, Design by Data is the perfect ground to learn by experimenting with digital design and technologies with a trial and error approach." "Every year we have ideas and projects coming out of the programme that can turn into long-term funded research projects or startups." The new makerspace of the school is one of the facilities available for Design by Data students and their prototyping needs, in addition to the Build'in the robotic lab of the school initiated by Navier lab and LIGM lab to foster experimental research on large scale 3D printing, machine learning, artificial intelligence and complex geometry for architecture and the construction industries. The spaces are dedicated to experimental research on large-scale 3D printing, machine learning, artificial intelligence and complex geometry for architecture and the construction industries. The Design by Data programme is also enriched by École des Ponts ParisTech's partnerships with local start-ups, which value the opportunity to work with students on joint research and development projects. One such company working with École des Ponts ParisTech is XtreeE, which develops multi-material 3D-printing technology for the architectural design, engineering and construction sector. "We help our clients create innovative designs and take the best advantage of large-scale 3D-printing techniques," said XtreeE co-founder Nadja Gaudilliere. "Collaborating with Design By Data at Ecole des Ponts ParisTech has given XtreeE the opportunity to push further R&D design projects, and develop new applications of 3D printing for architecture and design." Design by Data alumnus Célia Bugniot worked with XtreeE during the programme. The designer, who has a background in entrepreneurship and project management, undertook the course in its executive part-time format — one week per month while working for the start-up. She said the experience of XtreeE had given her practical insight into the future of large-scale 3D-printing. "Design by Data was a unique experience as it opened us up to many different technologies and gave us an extensive digital culture," said Bugniot. "Working with XtreeE gave me an opportunity to put these learnings into context and to witness first-hand the growing demand for these technologies, which offer tremendous value-creation potential in the construction market." Bugniot's final research project, Cloud Slice, explored this potential, combining 3D printing and generative design in the creation of daylight-filtering facade panels aimed at maximising visual comfort indoors. "My research project aims at highlighting this potential, using generative design to incorporate objectives deriving from various stages of the project lifecycle," she continued. Some alumni have continued to explore the themes of their Design by Data projects in subsequent work. Paul Carneau, an engineer who was part of the first Design by Data intake, has joined École des Ponts ParisTech research labs as a PhD student focusing on the topic of concrete 3D printing and the construction of cantilevered structures. He is currently using a six-axis robot provided by Build'in and equipped with a 3D-printing head developed by XtreeE. Among the most recent graduates is architect Mahan Motamedi. He conducted a research project investigating ancient bricklaying techniques and patterns, looking at their potential application in large-scale 3D printing for formwork-less construction. Design by Data also hosts innovation events and were recently a partner on the Fab City Summit in Paris.In January 2019, the École des Ponts ParisTech will be home to the DiXite3dPrint symposium and workshop, a major event in additive manufacturing for the construction industry. It has recently been selected to host the next edition of the conference Advances in Architectural Geometry in 2020. The fourth edition of the Design by Data advanced masters will begin in September 2019. Architects, engineers, designers and artists are now invited to apply. Applications will close in June 2019, but École des Ponts ParisTech advises that earlier applications have a higher chance of selection. For more information and to apply, see the École des Ponts ParisTech website. Main image is Tristan Gobin in the robotics lab at the school. Photo is by Yann Piriou – École des Ponts ParisTech.